I noticed this green liquid/oil on many conductors while inspecting the panel. 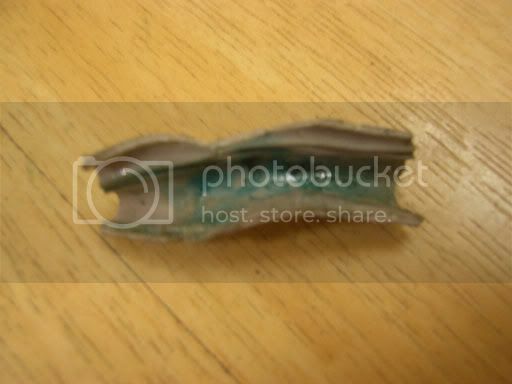 Through a little searching I found that it is a result of a break down of the plasticiser in pvc insulation. Has anyone had any experience with this and if so, how did you write it up? Do you recommend having the wiring replaced? Any info is greatly appreciated! Where did you find that info about the plasticizer? Also do you have an overall shot of the panel? That'a the first time I've heard of plasticizer migration occurring just due to heat and humidity. I thought contact with polystyrene insulation or some similar material was needed. Matt, the reason I ask about an overall view is to see where these wires come from and if they are different than all the other wires. If you are uncertain and concerned it's best to simply state the residue cannot be identified and refer it out. That being said, there is no visible breakdown if the sheathing and that residue could be a pulling lubricant or even an antioxidant which dripped from something above. Those are totally blind guesses but you can see there may be other simpler explanations to consider. Here are a few more pics I have of the panel. There was a mixture of some older wiring and some more recent. There are other issues with the panel that I called out and advised an electrician to evaluate further. My first reaction was that it is one of two things after reading the title. 1) paste for aluminum copper mix. That is not the case. 2) lube for pulling wires through conduit. Those look to be "newer" wiring. Was there a conduit run anywhere? or evidence of the green liquid on the sheathing of the wiring? "Make sure the oily residue is not from the lubricant applied to the wires to facilitate pulling wires through the conduits into the electrical equipment." Interesting....I am not aware of any anti-oxidant that is Slime Green..:) but then again I am not aware of all the anti-oxidant makers either(they are not members of the association I represent) and I do happen to have a few ideas of where it may have came from. 1) This panel was used on an episode of Nickelodeon and got slimed. 2) It was a successful electrocution of Slimmer (the Ghost from Ghost Busters). Other than that I would have to agree with the Data Bulletin provided by Jeffrey. However, what I can add is that this is not typical in terms of emulsification of plasticizer. In fact, I would venture to say it is VERY rare and condition specific. Also it tends to be Yellow and not green but then again it may depend on the plasticizer material used. Anyway, to determine this was indeed a rare case of emulsification would take an extensive investigations into the makeup of the material and composition of the oily substance. .
*Green gunge (sometimes called green goo) is sometimes seen exuding from the ends of some older PVC insulated and sheathed cable. This is seen in some cables made in the 1960s and 1970s, but is not generally seen in modern PVC cables. Its origin is the plasticiser used to provide flexibility in the PVC polymer compound. This is generally di-octyl phthalate, which over time or with excessive heat has reacted with the copper conductors to produce copper phthalate (hence the green colour) suspended in the liquid plasticiser. The material is of health concern, so should be handled with care - gloves should be used and waste disposed of properly. Industry guidance is generally as follows, if green gunge is seen. Although there does not appear to be a problem with the electrical performance or safety of the cable itself, any exuded gunge should be removed as it can cause corrosion or affect the action of switches and terminations, potentially resulting in tracking / overheating. It can also cause cosmetic problems such as staining. The affected circuits should be rewired as soon as possible. This is a perfect example of why so many people have joined InterNachi and choose to overlook the "message Board wars" and remain members! Whatever it is, the green color is most likely caused by its contact with the copper. If it is the plasticizer migrating out, I would love to hear one of our resident electrical guru's take on how to write it up. Does it warrant any level of concern? Does the presence of the plasticizer in the panel mean this could be happening throughout the house on similar wiring? Whatever it is, the green color is most likely caused by its contact with the copper. If it is the plasticizer migrating out, I would've to hear an electrician's take on how to write it up. Does it warrant any level of concern? I know this thread is old, but does anybody have a good link to the Schneider electric link? this one is dead. try this Canadian site it might help . Couldn’t find it on there though. I run into this once in a great while and I had that original link in my narrative, weird its just gone now. Thanks Chuck, Man your awesome! This may be an old thread but it’s the first time I recall seeing it, so I went digging for the source document. Pretty interesting. 2nd or 3rd time I have seen it. the other time was in a room with a hot tub, today (see pic) was a subpanel about 30" above a slab with hydronic heat.